Simone Thompson is making a Public Service Announcement—photographing artists and asking them about the impact they have on the communities they are a part of. A twenty-five-year-old self-taught photographer based in Los Angeles, Thompson primarily shoots 35mm and 120mm film and has been featured on i-D, Sticks & Stones Agency, and The Photographic Journal. 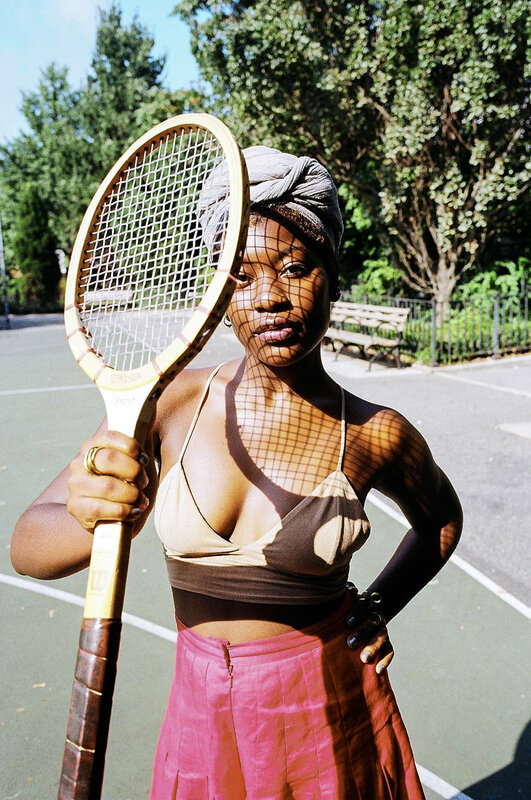 This installment of her series features photos and an interview with NYC based jewelry designer Sade Mims. My work is explorative and reflects my environment. It is colorful and off balance, always. When I design or create, I play with asymmetry and movement; I make shapes with my hands and try to interpret that in my pieces or on paper. It's fun. It's my way of storytelling. I initially started designing jewelry as an escape. I had been living in between Philadelphia and New Jersey and wanted an outlet to express myself. I started by collecting old items that my parents kept in the house and designing jewelry from those pieces. It happened organically and functioned as a source of therapy for me. How do you use your work as a positive influence to the communities you are a part of? For me, art should be a positive influence and inspiration to communities, always. My work is greatly inspired by my community, so the work that I create is supposed to give that same feeling back to the people who made it possible in the first place. I produce events in my community and I create spaces that bring people together. Whether it be through stoop sales, Garden Goods, or Love Train, my community is always at the forefront. What is a memorable interaction that you have had with someone because of your work? Oh gosh! There are so many. But one that seems to come to mind is over the summer, I produced my second installation of Garden Goods and collaborated with Apartment 4. Mecca and Ashley, who run that account, have now become such influential people in my life. I feel like it was divine and meant to be. I am most proud of my overall growth as an artist. I do a lot, so it is way too hard to narrow it down to one thing. I am finally realizing that I am entering a place that I am proud of. It’s one of the most liberating feelings ever! I have so much structure and clarity in my design process and work ethic that I feel confident to be in a space where I can teach others. I want to show my work in the Guggenheim Museum (I’m speaking this into existence).